New Kindle Fire HDX "Mayday " Kindle HDX Tablet Review: New Kindle Fire HDX "Mayday "
New Kindle Fire HDX "Mayday "
Will the new Kindle Fire HDX "Mayday" change the customer support and customer engagement industry forever? You better believe it! If Amazon's support team can execute the service flawlessly Kindle's new "Mayday" will change our industry and the current customer service framework forever! Finally a company that will provide on demand, live, true human to human video conferencing, fully engaged customer support. Gone are the days of the back office, out of sight, appearance doesn't matter, location (region) doesn't matter, customer support and engagement services. What does this mean for Kindle's competition? And what about the customer engagement industry as a whole? In the last few decades the emphasis of customer service and support as a significant leveraged marketing advantage has gone through a unique paradigm shift. In the early 1990's progressive companies where doing everything in their power to reduce the costs associated with providing customer service and support. This insatiable desire to drive down costs was the impetus behind the dramatic growth in the offshoring of support services. Originally intended and suited more towards back office tasks and functions (BPO), it was quickly rationalized that the cost savings could also benefit live agent customer service and support functions. This practice, while in its infancy, suffered dramatic hits to customer loyalty, satisfaction and retention. Those few companies that were fortunate enough to have a solid grasp on their backend numbers quickly realized the true financial impact that they were experiencing from the high loss of dissatisfied customers. Those losses quickly dwarfed the initial savings that rationalized the moves to reduce costs. Why someone buys your product? As the gaps between product differentiation become less distinct the level of customer service and support that a company chooses to offer becomes the only real reason for choice. The true cost of choosing to provide, or not provide great customer service has again become a market differentiator. I used the word again because through generations of time has not great customer service always been the expectation? From the 1990's fast forward to current day. In today's seamlessly connected world doesn't Kindle Fire "Mayday Button" offering seem like it should be the norm for all companies? Yet for some reason it's not. And in an even greater marketing move, the service is offered free on the Fire HDX! How many other companies would gladly charge an arm and leg for such a service, or if at all? If you have seen any of the recent commercials for the new Kindle Fire HDX it's the feature and benefit of the "Mayday Button" that stills the show. Don't you immediately think to yourself how wonderful it would be to have this type of button on all your smartphone, tablet, TV or any other devises? Now consider how industry altering this can be for the competitive market. Will all devices and manufacturers hurry to jump on the competitive bandwagon? So, think of your last customer service or customer support phone or chat experience and envision having done that via video conference! What would they have looked like, in what country was your call handled, and what would the office surroundings behind them have been? Now envision the challenges facing the customer engagement industry resulting from the emergence of this type of service offering. Not only for the manufacturer but the service provider they outsource too. 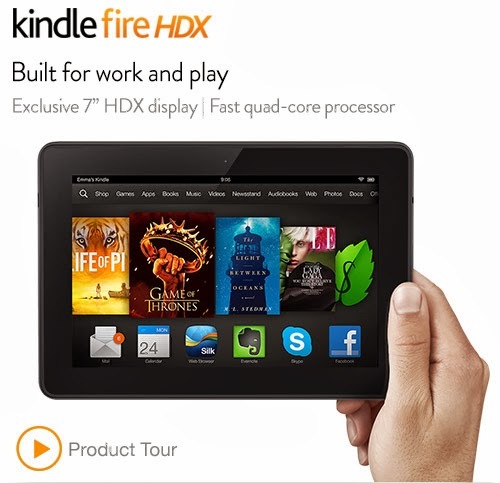 All said a welcome change and "Hats Off" to Amazon and the Kindle Fire HDX! It takes companies like this to drive needed change within markets and to recognize the sheer power of offering a seamless integration and convenience of service and support for users of their product. Having been in the customer service and support engagement industry for over 30+ years I have seen many companies do everything within their power to reduce and cut levels of service to their customers. While I'm sure Amazon will also be sensitive to associated costs, it is refreshing to see them make the commitment and seamlessly provide customer service and support video conferencing at the touch of a button, available at no additional cost to their customer. Amazon changes the entire framework of the customer service, customer engagement industry by simply adding a "Mayday Button" on its Kindle Fire HDX tablet. Competitors and customer service outsources take notice. This one event will change the way we all currently interact with customer service.